Hello and welcome to another installment of Lore Seeker, an article series devoted to the legendary creatures to whom Wizards of the Coast forgot to give a story. I’ll guide you through each fragment that makes up a legendary creature and finally give them a little extra background love. This time around we’ll be highlighting Yidris, Maelstrom Wielder. Yidris is an ogre from the Grixis shard (URB) on the plane of Alara. He was afflicted with unstable mutations brought on by a curse that threatened to shatter his mind. (Clearly he wasn’t running any enchantment removal.) After the conflux (the event that brought back together the separated shards on the plane) a squadron of Bant (WUG) Knights drove him into the Maelstrom Nexus. This event stabilized his mutations, creating a conduit for the chaos of the maelstrom. The way in which Yidris’s preconstructed deck was crafted left me (and others, I’m sure) a bit confused. The main theme was ‘wheel’ effects, named after the original Wheel of Fortune, and which includes such cards as Windfall and Wheel of Fate. Yidris does not get any bonuses from discarding cards, nor drawing large groups of cards, so why did WotC decide to go this route? Well, probably because it helps Kydele, Chosen of Kruphix‘s ability, one of the Partner commanders from that product, but I think there’s another good reason, too. Discarding and drawing new cards represents the madness Yidris underwent, evoking fleeting thoughts and the general chaotic nature of the gamble. Whispering Madness is a flavorful portrayal of these two ideas meshing together in card form. Understanding his lore helps to understand the nature of Entropic Uprising and gives me a greater respect for the way it was built. That being said, I still have some complaints. The main thing that I think feels off about this build is the way it affects your opponents. They are not the ones going mad, you are. Thus, the main goal of our Lore Seeker version of the deck will be to cast Fact or Fiction and similar effects as much as possible. Removing some of the control we have gives an unexpected chaos to the deck, without the oppressive nature of a true chaos deck. Yidris is unable to control his power; he is never sure exactly what will come of his magics, but something powerful is sure to occur. In order to squeeze in as many iterations of Fact or Fiction as possible, we’re running a small Sphinx package, including Unesh, Criosphinx Sovereign and Sphinx of Uthuun. Our opponents will face many a Choice of Damnations and regardless of their decision, Yidris will reign supreme. With this suite of spells we will never quite know what we’re going to get. I’d like to amp that up and use a couple of spells that will really take us off the rails: Mindmoil and Arjun, the Shifting Flame. As a nod to the original preconstructed deck, this helps to portray the madness present in the mind of Yidris. Keeping our hand full will be easy, so when we continually cast spells (especially after landing some damage with Yidris) we will likely always have another spell to play. Plus, Psychosis Crawler will love feeding off our psychotic thoughts. Maelstrom: a state of confused movement or violent turmoil. Wield: to have and be able to use. Being a wielder of the maelstrom shows that he has at least a small fragment of control over his power. The nature of the maelstrom may be chaotic, but Yidris has learned how to nudge the chaos in the direction of his choosing. Forgotten Lore and Shrouded Lore give us a mechanical way to influence those choices, but we can always use our words. Madness permeates the mind, coaxing others to join the side of the mad. Making deals and finding allies will be a major factor; playing your opponent is just as important as piloting the deck well. Humble Defector, Skullwinder, Collective Voyage, and Fevered Visions will help in your quest to make friends while spreading a little madness. Blue: Blue respects the importance of intellect. It believes that the world is a collection of resources that allow an individual ability to transform their-self into whatever they wish. Black: Black simply wants what it wants and will use any means necessary to get it. Red: Red is willing to take action to ensure they are able to act freely and will not let anyone or anything tell them otherwise. Green: Green’s mission is to protect the natural way. The influence of the maelstrom has modified this mission to protect and expand the maelstrom’s agenda. Yidris was originally aligned with blue, black, and red before the conflux (the event that brought the separate shards together). The maelstrom’s influence introduced a direct connection to green mana; the color most closely tied to the natural world, providing Yidris with a greater connection to raw mana. A four-armed, crude poleaxe-wielding Ogre; a mini maelstrom surrounds him as he shouts with rage while power fills him. Yidris is one of the few ogres in Magic that has two sets of arms. He belongs to a group of Ogres on Alara known as Incurables. 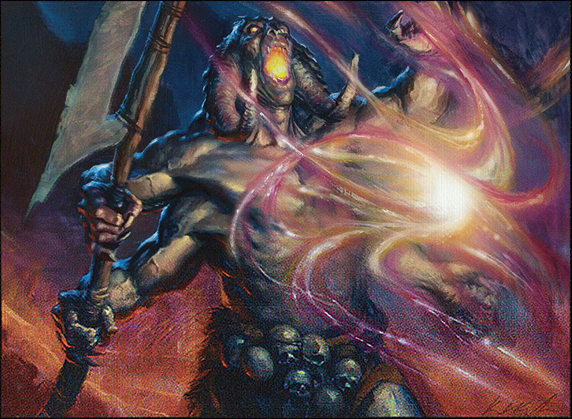 A form-altering curse mutated a major portion of Ogres aligned with Grixis when the shards split apart. We already know what his disease did to his mind, but it would seem there are physical ramifications of this mutation as well. The only other Ogre on Alara with four arms is Fire-Field Ogre and it is classified as a Mutant. 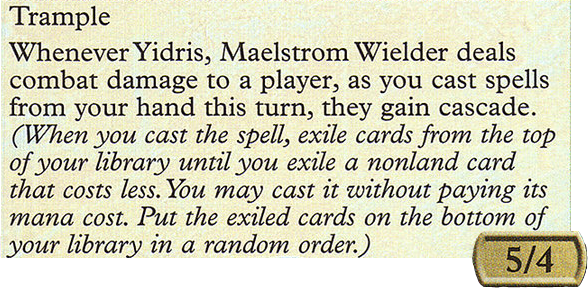 I feel this description would carry over to Yidris as well, but through his exposure to the maelstrom, he has become a Wizard. An Ogre Wizard is a rare occurrence; only two exist. 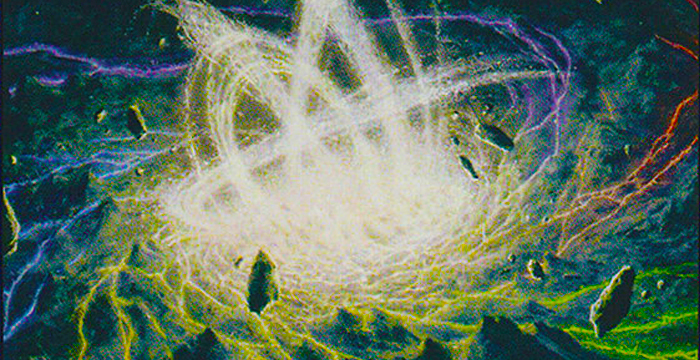 As we explored before, the introduction of the maelstrom’s power created a bond with raw mana and the ability to utilize it. It likely bestowed Yidris with hyper-intelligence while simultaneously compounding his madness, potentially developing a split personality or schizophrenia in the Ogre. His mind has been corrupted and permeated with the thoughts of this sentient force within the maelstrom. Visions and voices cloud his mind and his power seeks a way out. In order to embody the chaos a bit more fully, I added a number of random outcome effects. Last One Standing, Unexpected Results, Whims of the Fates, and Signal the Clans to name a few highlights. Taking the control away from ourselves with Fact or Fiction is nice, but true randomness is better. We’ve added a little consideration into the deck to make this ability work. We are running multiple haste enablers and a strong protection package. The main consideration with the Cascade ability is the curve of converted mana costs. The most difficult slot to fill was at zero mana; ultimately I narrowed this down to a single card at zero: Ancestral Vision. It fits with our theme of otherworldly visions and helps to fill our hand. It also feels incredible to guarantee drawing three cards when casting a one-drop with Cascade. The deck lacks evasion for our commander, and in general we are hoping to get out fast to start swinging. It would likely be worth running permanents that grant evasion, such as Thassa, God of the Sea, because Cascading in to a combat trick that grants evasion (Slip Through Space, etc.) would certainly feel quite bad. 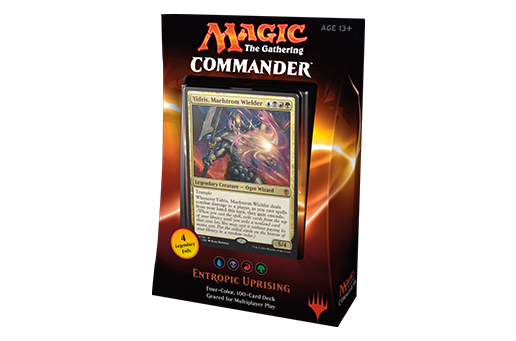 Yidris is exceptionally powerful, and according to EDHREC he is the number seven most popular commander of all time. Though powerful, one of the problems with him is the relationship between his mana cost and his ability. Ideally you want to have Yidris out as soon as possible, which means having all four colors of mana as soon as possible. The majority of the deck consists of very cheap draw spells and bulk rare Sphinxes, so I directed all extra attention towards the mana base; a large suite of fetch lands along side a full suite of shock lands should enable the casting of Yidris on curve. Our ramp suite is primarily two-mana spells to help facilitate this as well; if you ramp on turn three, Yidris doesn’t come out any sooner, but ramping on turn two can certainly help his tempo. I found while playtesting that haste is overrated early on. Casting a hasty Yidris early, even on turn four, leaves us with little to no mana leftover to take advantage of that Cascade ability we’ve worked so hard to abuse. As a result, there aren’t too many haste enablers, since we’d like to cast several spells on the turn Yidriss connects with an opponent. There are some haste options, though. I included Rhythm of the Wild because it gives us the option to make Yidris a little bigger, not to mention the added utility of making him uncounterable. Focusing on protection proved to be the more valuable route so the boot duo of Swiftfoot Boots and Lightning Greaves was also integral. I’ve fallen in love with this deck. The more work I put into it, the more amazing it felt. Fact or Fiction and other out-of-our-control spells are a lot of fun to use, and building a deck around them will create situations where we always have something to do. When assembling a deck with a powerful commander like Yidris, it is going to automatically draw hate from the moment you reveal who your commander is, but giving them control over some of your cards may help convince them to join in on the fun, and perceive you as less of a threat. In other words, the deck will be a blast to pilot… and Yidris’s chaotic madness is starting to spread! That’s it for this week! As always, let me know which legendary characters you’d like to see get the story spotlight in the future!